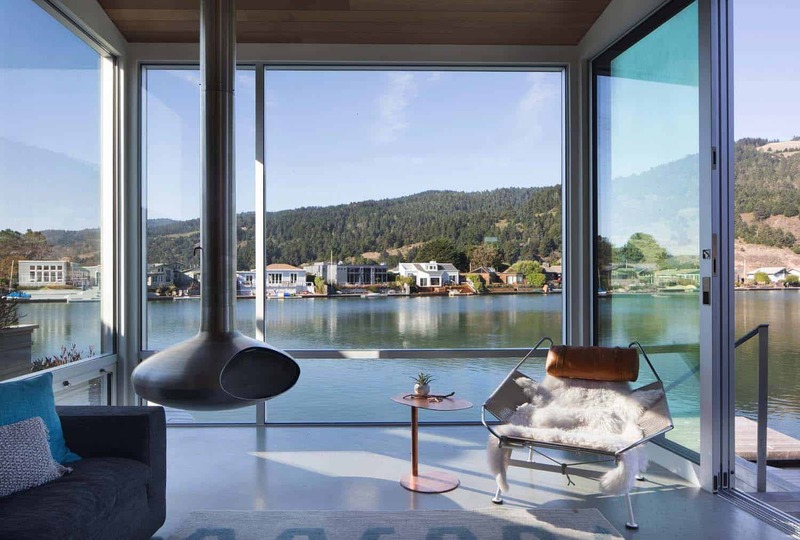 This contemporary beach house retreat was designed by CCS Architecture, located in Seadrift on the Stinson Lagoon in Marin County, California. Although the lagoon is filled with Pacific Ocean Sea water, it is shallow and warm – much like a lake and so used for swimming, paddling, and many other non-motorized water sports. 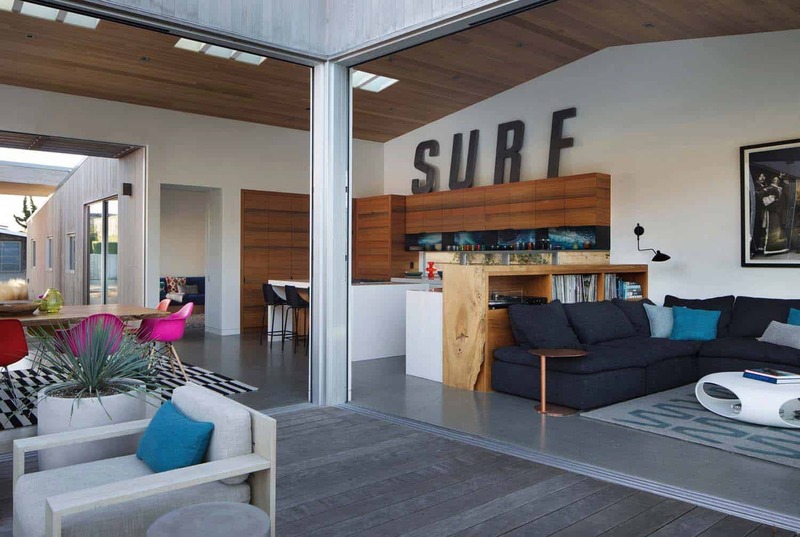 While beach houses are often tattered and somewhat quirky, this one is meant to be modern and refined, yet casual. 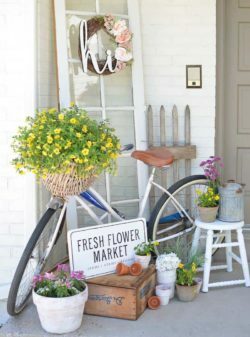 This 2,100 square foot home was created for a family of five who live in San Francisco and enjoy surfing, cooking, crafting, and entertaining. The design process was very collaborative and enjoyable. Marin County coastal codes require houses in this zone to be notably elevated above the sea level, which results in houses being quite high in relation to the lagoon and ocean. 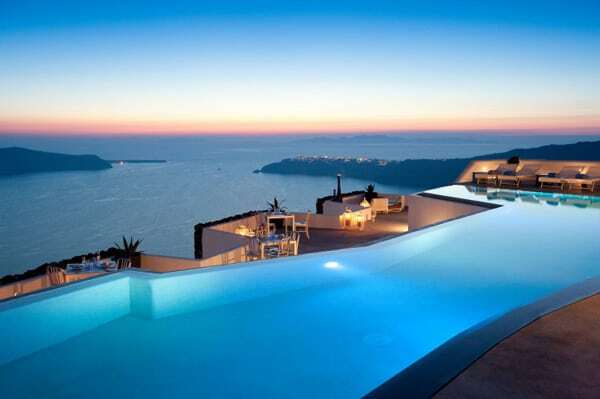 This creates a situation where the buildings have two sides: in this case, northward with decks and steps that cascade down to the water, while the south side is more level and expansive with exposure to the southern sun. With this dual orientation, the main spaces of the house open up for maximum indoor-outdoor living. 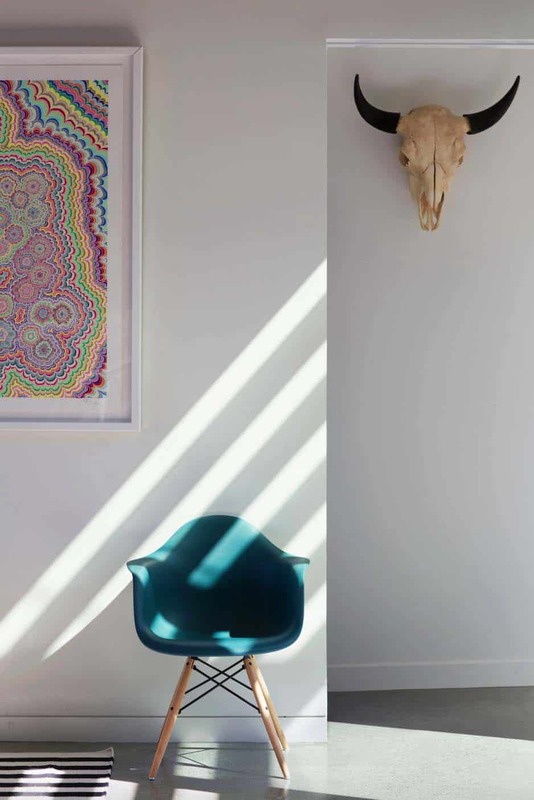 Stinson is fairly sunny with spectacular natural light and so this dual orientation also captures as much light and fresh air as possible. Inside, the building is zoned into living and sleeping wings. 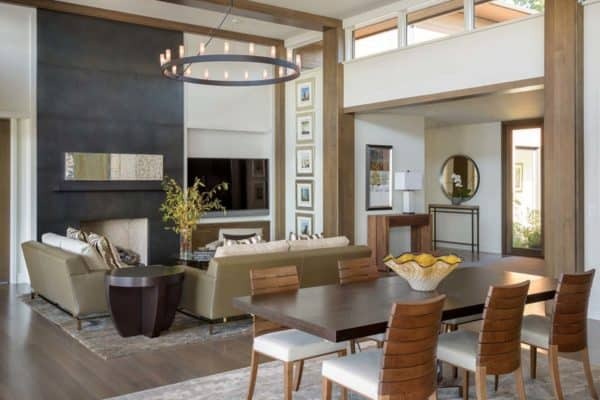 The living room, kitchen, and dining spaces comprise the main area with high wood ceilings. 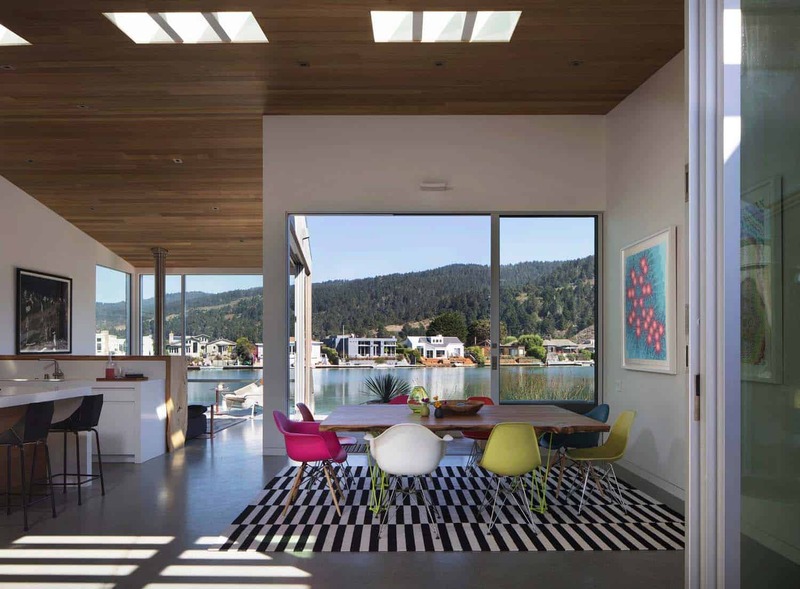 Strategic skylights bring in patterned natural light from above to balance the south and north light. The bedroom wing is situated to be separate from the main space, and has two bedrooms plus the ‘bunk room’, which the three kids share. It has three double bunks and one loft, sleeping seven. 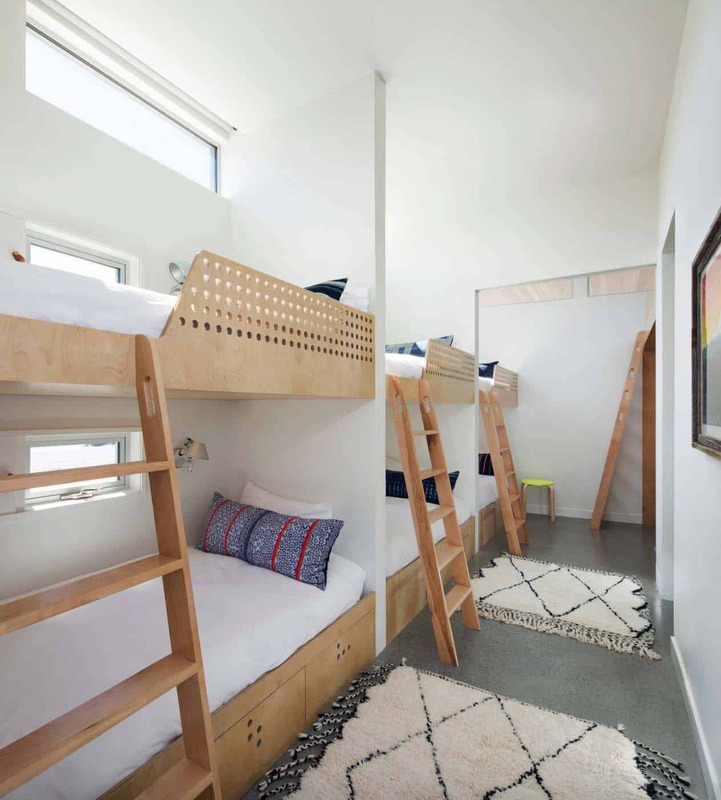 Each of the bunks has its own small window and reading light. 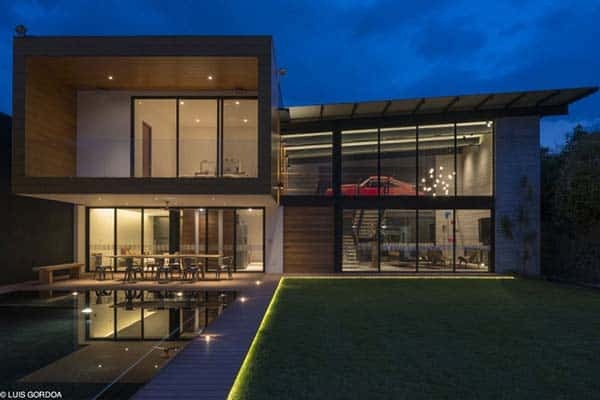 The form of the house is essentially a courtyard, yet with the higher roof cantilevering over the courtyard entry to create an iconic portal to the house as seen from the road. 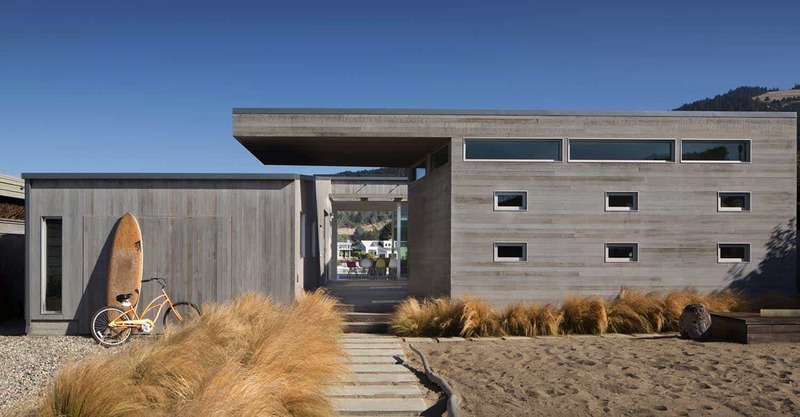 The exterior is sided with clear-heart western red cedar – stained grey for a weathered look. The inside is primarily a combination of white sheetrock, sinker cypress boards, and concrete floors. 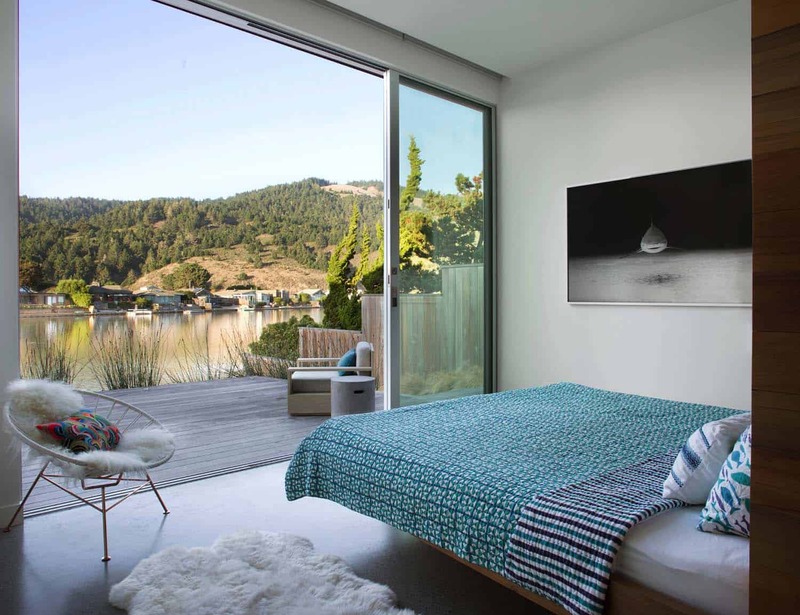 All of the sliding doors and windows are aluminum frame with high-performance glass. 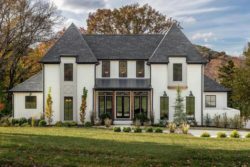 The flat portion of the roof has photovoltaic solar panels, which generate all of the electrical needs, resulting in nearly a net-zero energy house. 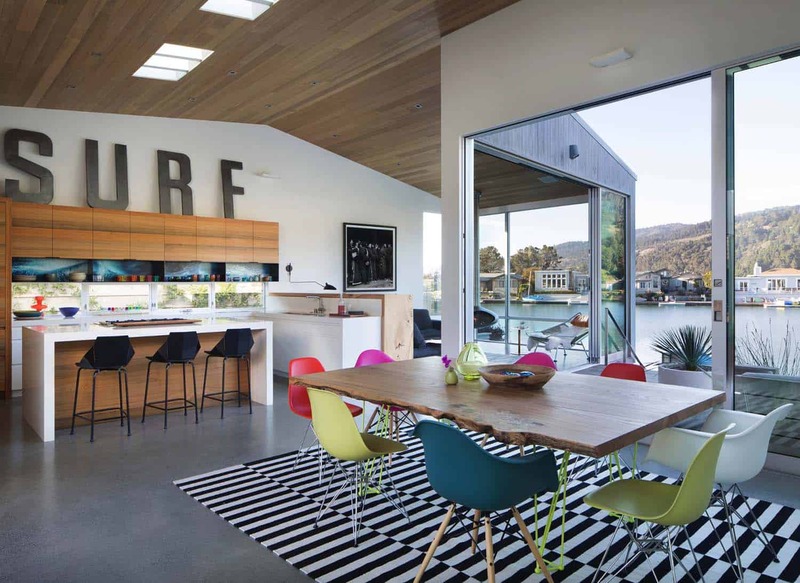 What We Love: This bright and airy beach house retreat offers a fantastic indoor-outdoor connection thanks to expansive walls of glass. 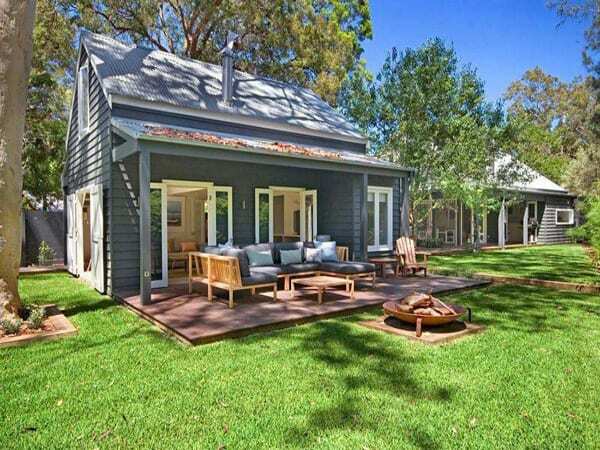 Overlooking the water, this home is very ideal as a family vacation retreat. 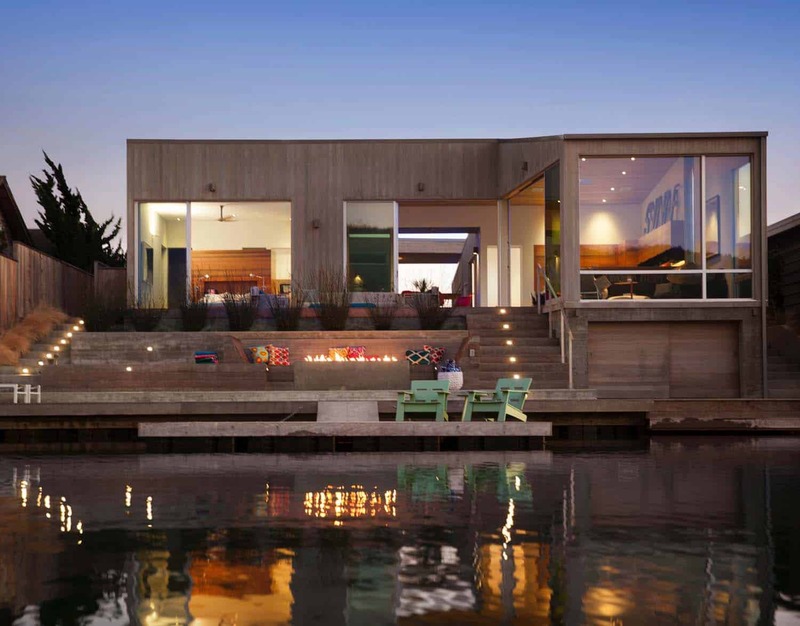 Interior spaces were designed to be casual and relaxing, while outdoor living spaces cater to waterfront views. 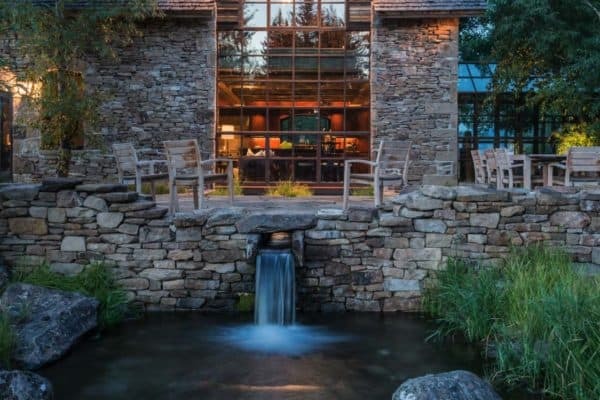 An outdoor deck provides convenient access to the water to allow for the family to enjoy water activities… Readers, what do you think of this retreat, would this be your ideal weekend getaway? Tell us in the Comments! 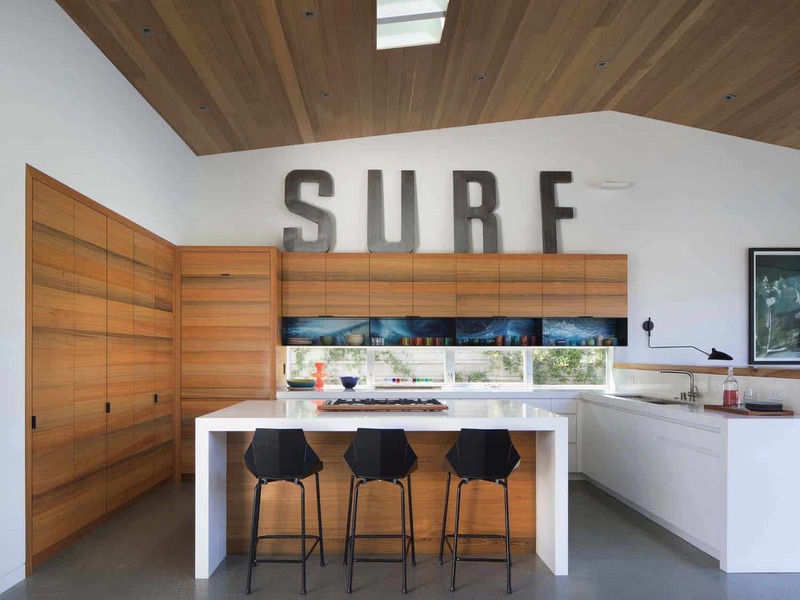 Above: The SURF lettering is by RH Teen and the kitchen stool is by Bludot. 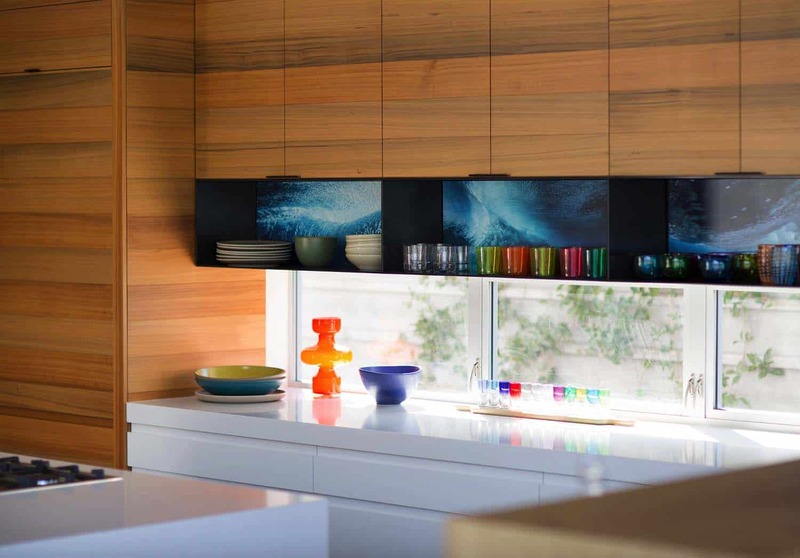 Above: In the kitchen you will find Caesarstone countertops and sinker cypress + powder coated steel kitchen millwork. 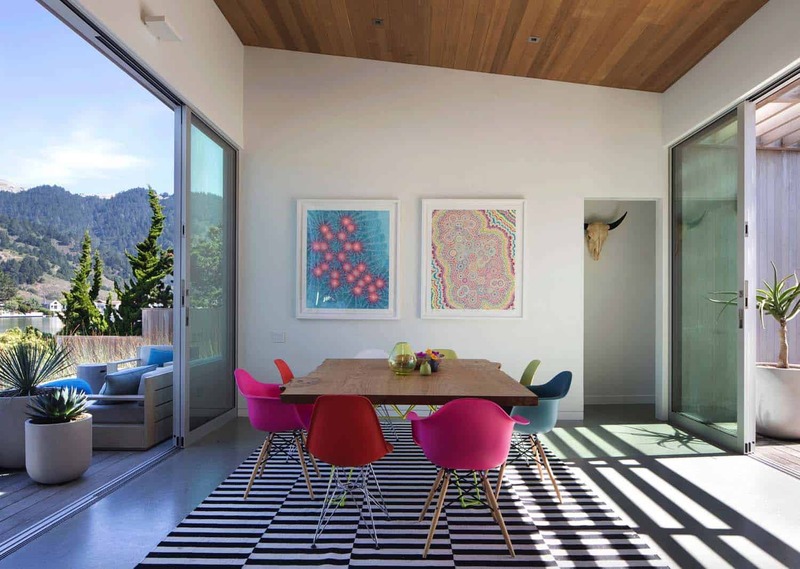 Above: In the dining room, a custom elm wood dining table is accented with Eames style chairs. 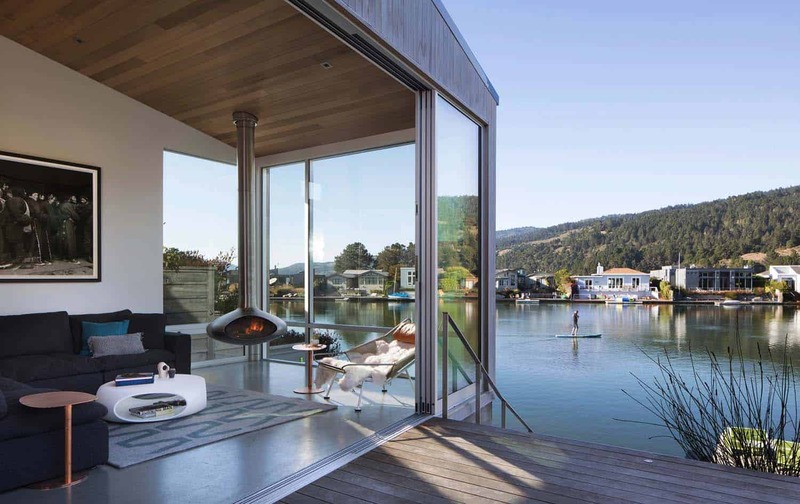 Above: A hanging fireplace by FireOrb draws your attention to the water of Stinston Beach. 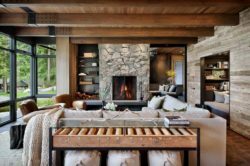 Made out of 10-gauge steel with a matte black, heat-resistant finish, this suspended wood-burning fireplace allows 360-degree rotation. Above: A custom sinker cypress bed. 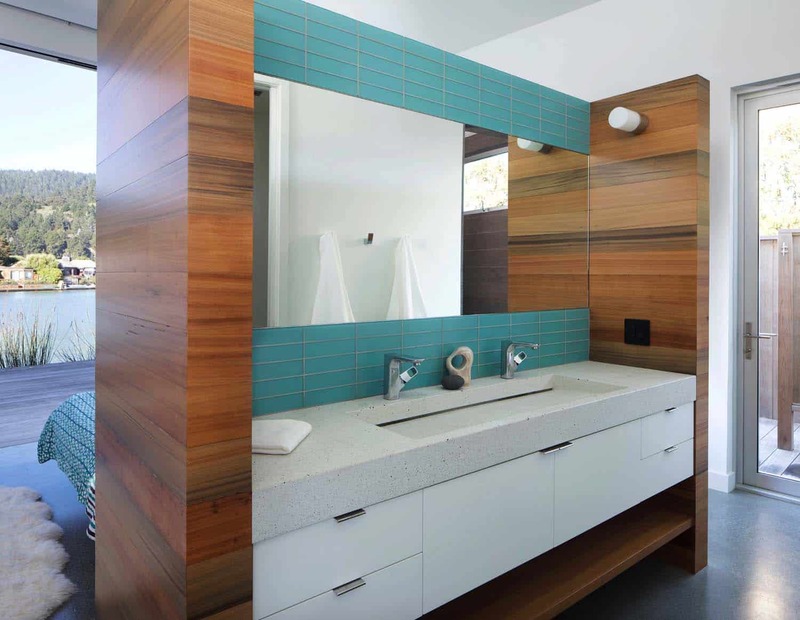 Above: The master bathroom features glass tile, concrete countertop, and custom sink. Above: Night view of the deck leading to the dock.